With over 2 million weddings taking place every year, there are plenty of creative ways to make your wedding stand out. Read on to discover the top 5 wedding banners and signs to choose for your big day. Nearly 800 million people use Instagram, so it’s more than likely true that your guests will be snapping away with their phones while attending your wedding. Keep the posts coming by creating your own unique hashtag for everyone to use. The hashtag will be unique to you and your husband. Post your hashtag at the front of the wedding venue for all to see as they walk in. For example, if you are marrying someone in the near future and changing your last name to his, choose a hashtag like #MrandMrsCole. This hashtag will identify your wedding and can be used all throughout social media, from Facebook to Snapchat. More wedding banners include messages saying, “Choose a seat not a side” in 2018. These wedding banners can be hung in the back of the pews if you are getting married in a church setting. The ceremony seating sign can also direct your guests on a chalkboard. Chalkboards are rustic and may fit into your wedding theme if you are getting married somewhere outdoors. As you exchange wedding vows, why not hang a wedding banner across the top of your ceremony arch? Find a quote that the two of you love and add the sweet message for all to read once you walk down the aisle. Some cute examples are “All you need is love” or “And the story begins”. A popular trend that has taken off lately is down the aisle signs. The ring bearers and flower girls are stepping out of their traditional roles and carrying signs that read adorable messages. The sign they carry depends on the style of your wedding. If you are getting married outside, you can choose burlap as your sign material. The best messages spell out “Here comes the bride” or “X, here comes your bride”. Another funny message would be “It’s too late to run, here she comes!”. One more seating sign you should emphasize on your wedding day is for the reception seating. Find a long table to display all the names as soon as your guests enter the reception hall. If you choose not to have assigned seating, you can hang a sign that reads “Mix, mingle and move your feet, enjoy the night with no assigned seat!”. Having an open seating option at your wedding will make your guests feel free to roam around and sit where they feel comfortable, too. 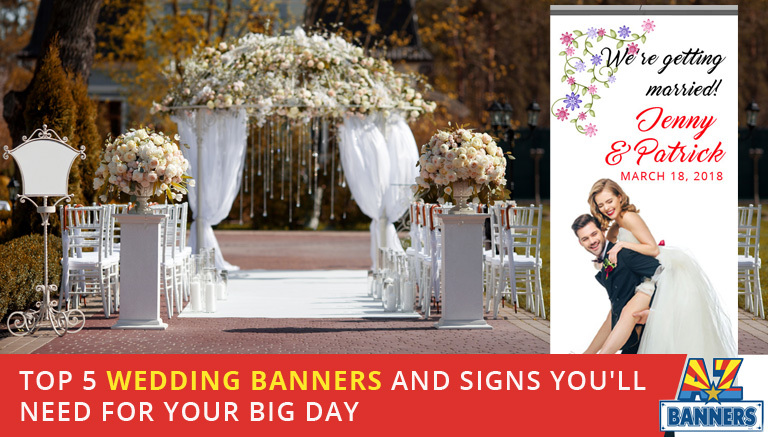 Ready to Design Custom Wedding Banners? AZ Banners has you covered if you need banner signs or decals. We’ve been family owned and operated since 1996, and we deliver high-quality products to each and every customer we meet. Contact us today if you plan on getting married this year and want assistance creating your own wedding banners with our experts. Looking for an affordable wedding sign company to create a custom wedding banner or sign for your big day? Contact AZ Banners today for great service and fast turnaround! Call us at 480-458-8128 ~ Our products ship fast, anywhere in the U.S.! What Is a Step and Repeat Banner and Why Does Your Business Need One?